I took the ice bike out this morning and rode around the neighborhood streets between Mead High School and Pattison's Roller Rink. It was 2 degrees Fahrenheit with just a touch of wind chill. 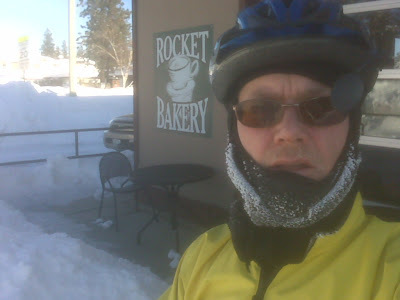 It was easier riding than yesterday since the roads were frozen. I had to let some air out of the tires so the studs would get a better grip on the extra glazed parts of the road. I realized that when my tires started sliding out from under me on one spot. My speed was barely that of a fast walker so I thought I could save it. I was hopping on one leg while sliding sideways across the road. The thought didn't occur to me that if the tires weren't gripping my boots probably wouldn't either--until my boot let me in on the secret. I rather inelegantly laid down on the road. Fortunately, no other souls were outside to witness my embarrassment. So I bled some air out of the tires giving them a better grip but increasing the rolling resistance. Well, it's not like I was going anywhere fast anyway. Stopped by the Rocket Bakery on Hastings and treated myself to an oatmeal raisin cookie because I deserved it. Nice one, Pat. I hope you're saving these up for publishing some day.